Dr Patel is a Consultant Cardiologist at the Royal Free NHS Trust and also offers private Cardiology consultations in clinics across London. ​His extensive training in both London and Oxford has equipped him with a wealth of expertise that enables him to effectively treat all aspects of Cardiology. He has a special interest in Cardiac Intervention, which involves the use of minimally invasive techniques to diagnose and treat heart disease. Dr Patel's primary goal is to provide excellent care to his patients who he puts at the heart of the decision-making process. 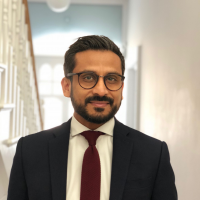 Additionally, Dr Patel is a Honorary Senior Clinical Lecturer at University College London and his active involvement in Cardiac research enables him to be at the cutting edge of his speciality. He has published over 30 scientific articles in peer reviewed journals, as well as being an investigator for several international trials. His primary areas of research are in coronary physiology, microvascular function, intra-coronary imaging and myocardial infarction. He is passionate about training the next generation of doctors and as well as being a Cardiology module lead for UCL medical school, He is also responsible for training specialist doctors in both Cardiology and Cardiac Intervention. Dr Patel offers expert cardiovascular advice and treatment for a diverse array of symptoms. Treatment of ischaemic heart disease, angina (chest pain) and heart attack; Treatment of heart failure (breathlessness), arrhythmia (palpitations), atrial fibrillation, high blood pressure and valvular heart disease (murmurs); Management of primary and secondary prevention (coronary risk reduction); General cardiology. Royal Free NHS Trust in London. Dr N Patel uses the scientific rigours of his research expertise and critique, along with the best evidence based medicine, to inform the decision making process for his patients. Selected publications are listed here. De Maria GL, Patel N, Banning AP. Obstructive left main stem coronary disease: is it time to recommend coronary stenting? Heart BMJ 2017 doi: 10.1136/heartjnl-2016-310880.